When it comes to game balance we often discuss power creep. Power creep is hard to control because we spend our time killing each other and we’d like to do that in the most effective was possible. However, there is another, insidious thing working into my life. Bling creep. It was not until I lost the Large Jaguar and cheered that a shiny module did not drop that I realized that I had succumbed to bling creep and I did not know how to stop it or if I really wanted to. Yet, somehow, I had not expected this to happen. "Not me," I would say. "I'm not someone who can fly shiny things." Eve isn't a game where we get to show our amazing on the outside. We show it on the inside and by our abilities and reactions as we fight. Shiny things in Eve tend to be expensive or rare (rare also normally meaning expensive). Because of our true loss, having something nice and undocking with it puts that nice, expensive, rare thing into a position to lose it. That gives things a greater value and part of fitting ships is often deciding on how much one wishes to spend in ones activities. Therefore, the activities themselves dictate the fits. It is not always a call of most expensive must have. Sometime ago in a blog post I am too lazy to find, I discussed that I would start flying more expensive things when I felt that I was ready to fly more expensive things. My logic was that my abilities were so poor that the improvements of shiny modules would only make my inevitable wrecks more expensive. At some point along this path Ender finally said, "You are allowed to lose expensive things, Sug." That day warmed my heart but I still found myself clutching my wallet close to my heart. I thought that I would wake up and know that I had improved. Obviously, that was wrong. The bling creep was slow. It started with my Loki, I believe oddly enough. It is a ship that I barely fly. It's fit was not selected by me but is part of a doctrine. A a firm believer in following my corporations doctrines, I allowed myself to fit into a blingy(ish) ship because it was not me. In a way my Jaguar's have always been a bit blingy considering that they are frigates. But they tank like light cruisers and they got the job done. Non-optional bling is on a different level than optional bling. A Rifter would not do the job of my Jaguar. That is also how I explained my Sleipnir to myself. My Sleipnir+Scimitar combo was a core to my ISK making and the value of those two ships were overshadowed by the ISK that I made flying them. But I never flew them into PvP and they earned their keep dozens of times over. I think, however, it was when I accepted Kaeda's blingy Wolf fit that I had stepped over the line without a personal justification as to why I was doing it. At some point between fitting out my Loki and voluntarily going to buy this Wolf, I had moved forward mentally as to my abilities and what I considered 'okay' to do. I then added a shiny Sleipnir to my stable, made sure my expensive ships all had T2 rigs (after all their price came down with Odyssey), and in general increased the overall value of things based upon their use and the abilities the various modules will add. Sometimes it was just to improve a fit and as my support skills have come in line I find myself able to do shoehorn fits. Sometimes the faction module is 'only' a few million and seven million ISK may be the difference in resist or hit points to turn a fight. But, for all of this, it was the Large Jaguar that made me realize what was going on. That I had changed. When I sat in Jita and looked at the various distances for faction webs vs their prices vs the probability of my living for any reasonable amount of time to use said web mixed with the fact that I fully believed I had the ability to use the extra distance said web gave that I realized that I had turned some type of personal corner without realizing it. Such is often the way of it. I don't think that I will become a loot pinata. Some of it is a side effect of being financially stable. Then moments like tonight, when we kill a faction fit Legion (again) and fleet members buy the loot from the fleet. There is something pleasurable about these reused modules and they feel different from market brought but they are all rather shiny. I see the corruption of the bling run through you! There is no stopping now, you'll be flying a Titan in a year! I am inordently fond of every one of my active characters. I would never put then into an overly expensive coffin. I'll never have more fun by flying risky for the sake of it. However, I am enjoying relaxing about what I do. There is a difference between risky and reckless. Sometimes i enter a fight having no idea the outcome but it's fun to find out. The risk of bling is that you decline fights you might have accepted in a cheap but effective ship. Last couple of months I've been roaming in small gangs a lot, mostly in T1 frigates. My favourite is a Merlin fit that costs about 9 million isk. We take tough fights like 2 merlins v hawk, with possible adds, because it's worth risking them to get a fun kill. I lost 16 merlins last month but I certainly got 150 million's worth of fun out of them. In total I got 54 kills mostly flying them with 1-2 other people, almost all of the kills being more expensive than my ship. Many of those kills came from fights I would not have taken had my ship cost 50 million isk. I don't think I'd bring a Merlin. I don't think I'd bling my Jag. I'd fly a Jag before a Merlin. I'd not go solo PvPing in ether. I don't care about efficiency. I will lose a tackle for a hauler just in case its not empty. The ten bil in PvP ships in my hangar is ISK spent and just not destroyed. I know the price of implants and ships and fittings make decisions for some people. Not for me cuz I made my decisions before that. I'm never going to be the carefree pilot that takes big risks in T1 frigate's just in case. I'm just not that person. I don't go I got x ISK of fun from my Jaguars. I fly them because they make me want to undock and give me the confidence to fly. Maybe because I am not a good PvPer or a pure PvPer and I'm a scrub carebear but my entire game functions in an circle of making ISK and losing ISK without worrying about the numbers and always making sure I can afford what I want. 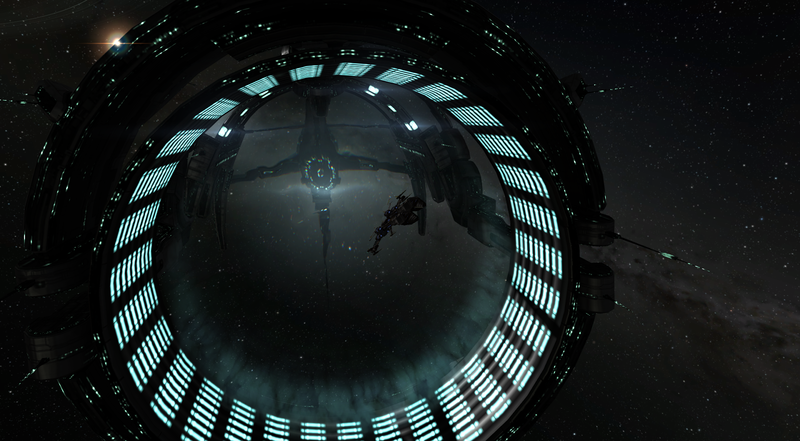 "Many of those kills came from fights I would not have taken had my ship cost 50 million isk." First I'd like to point out that it's therefore also safe to presume you'd have won those fights in a 50 million Harpy too ;-) (presuming the opponent would still have taken them as well). So don't fly what you can't afford to lose vOv Sometimes I fly 10 million Rifters, sometimes I fly 100 million Jaguars, regardless of which I undocked I'll take any fight I deem interesting the price of my ship is irrelevant after I undocked it, I already lost that ISK as far as I'm concerned. I don't own ships to look at them, I own them to fly them, what good is an expensive ship if you're not willing to risk in an interesting engagement (be it solo or gang)? Last sunday I welped a 300M+ Maelstrom in an 'unfun' way, what bothers me about a thing like that isn't the 300M, it's the fact I didn't get to have a fight. If you have a 10% ISK efficiency but you're having a *blast* everytime you undock you're still doing what games are meant for; having fun. "Then moments like tonight, when we kill a faction fit Legion (again) and fleet members buy the loot from the fleet. There is something pleasurable about these reused modules and they feel different from market brought but they are all rather shiny." I like how you put this. Having a story, and adventure behind your acquiring the mod adds its own value that stays with it yet isn't just a trophy.